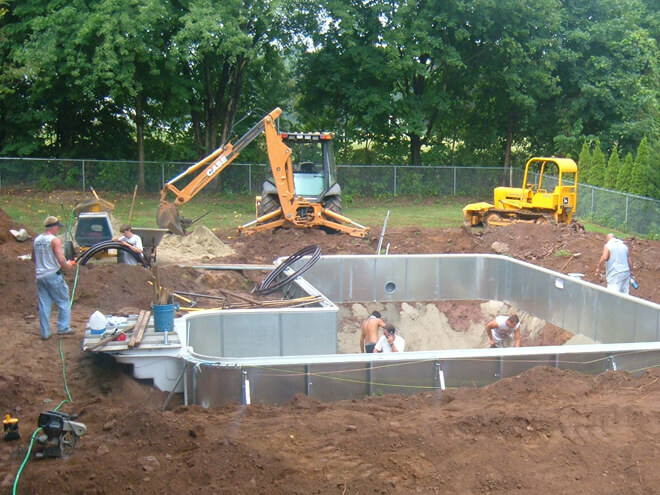 Inground pool installation is a big project, but if have the right team and budget, it'll go as smooth as a whistle. There's just nothing like being able to walk out of your back door and hop into a pool. It's refreshing, it allows you to host the best outdoor parties, and it can increase the value of your home. Before moving forward with any major renovations on your home's exterior, you need to know what an inground pool installation is likely to set you back. It's highly recommend that you compare estimates from at least 3 local pool installers near you to get a better idea of pricing trends in your specific region. Also be sure to compare quotes and check for references. This way you will ensure you get the best contractor, an efficient installation, and value for money. The first cost to consider, outside of digging the hole and contacting the city to make sure no utility lines are in the way, is the pool liner. This prevents water from leaking into the surrounding ground. Most liners are either vinyl or fiberglass, although more expensive and durable options exist such as concrete or gunite. Your choice of pool liner can substantially raise or lower your final cost to install an inground pool. Vinyl is the cheapest, then fiberglass, and finally concrete or gunite being the most expensive. You don't need to go all out with the seating or decorations, but you do need to have a safe walkway. Many cities have very specific measurements for how far away the pool can be from the house, the width of the walkway and other precautionary rules. A contractor can help you understand these requirements. The fence is required by law. There is a set height minimum for the fence as well. Here, you can go with something inexpensive, like a chain-link fence, or you can upgrade to wood, composite or cast iron, depending on the look you're going for. The average cost of this add-on is generally around $1,100. Installing a pool is more than just the lining and preparing the hole. You'll need to have pumps, ladders and, filters installed into the pool. You'll also need cleaning tools and maybe heaters as well. Depending on the style of pool you have chosen can all significantly increase the project costs. Salt water pools are becoming more popular, and while the pools often take more work to maintain, it can be less expensive in other ways. This type of inground pool installation does not require the inclusion of chemicals in the water. Inground pool installation is far more expensive than an above ground, but there are far more advantages to this style. On average, you can expect to pay right around $20,000 for the new pool. However, it can change in price based on materials used, and the size of the pool being built. Should you go with a fiberglass pool, you should expect to pay closer to $28,900. Other pools made from gunite or concrete stretch upwards of $35,800. These estimates do not include the cost of fencing or patio installation, which can potentially double the price tag altogether. They also aren't something you can skip as most locations require you, by law, to install a fence and a safe walkway around the pool. With all of this in mind, it is up to you to decide whether an inground pool installation is the best option. Simply enter your zip code here in the space provided and you will take advantage of this 100% FREE, no-obligation offer to get a professional breakdown of the cost for inground pool installation project. So go ahead and give it a try - there's absolutely no hidden costs or charges!